Australorps are a very good, all purpose breed of chicken. They have a relatively meaty body and are very good layers as well. Size: Standard Male: 8.5 Ibs. / Standard Female: 6.5 Ibs. Bantam Male: 30 oz. / Bantam Female: 26 oz. Comb, Wattles and Earlobes: Moderately large single comb with five evenly spaced, perfectly straight points. Front point is smallest. Oblong, smooth earlobes. Male: Medium size, smooth round wattles. Female: Small, well rounded wattles. All bright red. Color: Black beak; dark brown eyes; shanks are black to dark slate; bottoms of feet and toes are pinkish white. Standard black plumage. Special Qualities: Good dual purpose bird that has a relatively meaty body for a layer. The Australops were originated from Black Orphintons that were imported to Australia from England in the late 1890's and early 1900's. 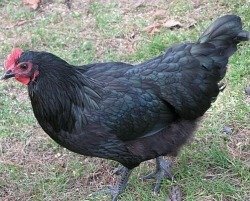 These Black Orphingtons were crossed with a variety of Minorca, White Leghorn, Plymouth Rock, and Langshan breeds to come up with the final mix. It is now Australia's unofficial national breed of chicken. The breeders that came up with the Australorp focused on utility. Today, that is still what the breed is known for. It is a great dual purpose bird that has a meaty body, but can also lay two hundred plus eggs a year as well. Sometimes called Black Australorps as well, the breed matures early and is considered to be docile, quiet birds. They have loose and fluffy feathers that make them weather hardy as well. They were first admitted into the APA in 1929.